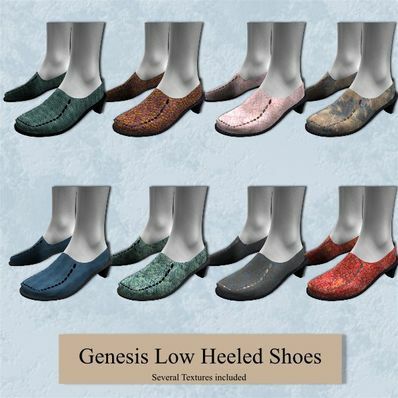 Plain and simple low heeled shoes for Genesis for use in Daz Studio 4. Use the foot pose to get the shoes to fit Genesis initially. You may have to adjust the shape of the toes & shoes if the pose is extreme. Toes have been bent to an angle of -15. These look like they would work with the oriental style as well, will try it. Thank you for all the textures and MAT zones as well.